Butterflies are indeed pretty as flowers plus they help pollinate plants whilst they feed on the nectar. Most species of butterflies don't have caterpillars that eat our crops so we should be encouraging these pretty pollinators in our gardens. 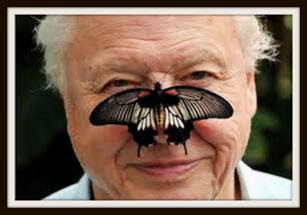 As the Big Butterfly Count has just started, I thought I'd find out just what we can do. Apart from them looking really, really pretty that is! Butterflies pollinate plants as they drink their nectar. Since a butterflies' legs and proboscis are further away from their body than those of bees, they are not quite so good at pollinating our plants. But they can fly further and so help ensure our native wildflowers grow in lots of places for lots of us to see. Also they can help reduce the effect of bee diseases on pollination. From July 17th there has been a big butterfly study carried out by people like you and me all over the country. Last year a massive 44,000 people took part. 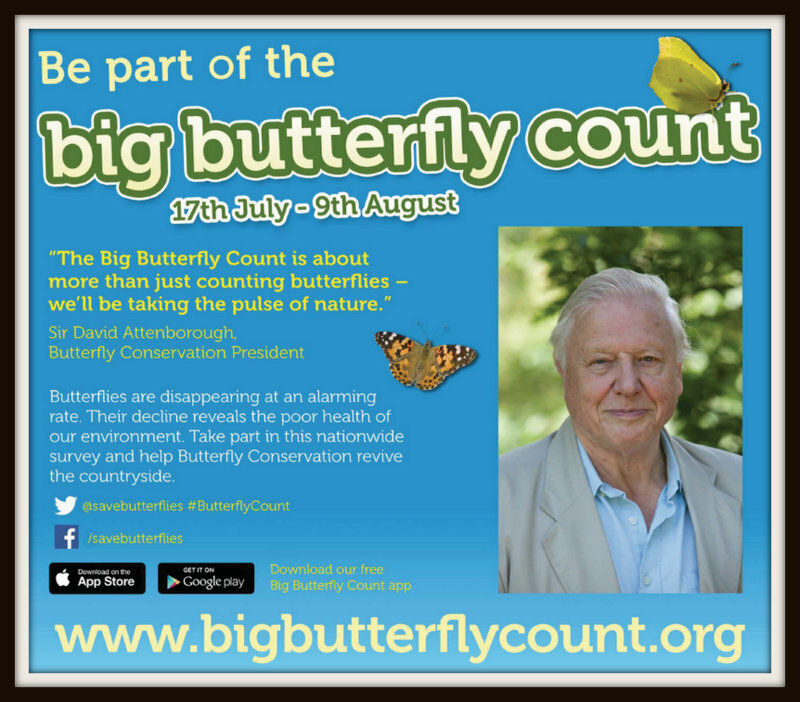 It's called the Big Butterfly Count and will find out how healthy nature is. Butterflies react really quickly to changes in our environment so they are great at warning us early of problems. Also it is good to know if any types of butterflies need more help from us so we can make sure they get back to being happy. To take part you just need to try to sit still somewhere nice and sunny (so the hardest part will be finding sunshine in Scotland then!) for 15 minutes. Then count how many of each different type of butterfly you see. You can get a really useful identification sheet from the Big Butterfly Count website. There are different ones for Scotland Wales, England etc. Once you know what type of butterflies you saw you can input your results into the Big Butterfly Count website. Your work will still count even if you don't see a single butterfly. If you're aged between 5 and 10 you can take part in the Count at Jupiter Urban Wildlife Centre on Wednesday July 29th. 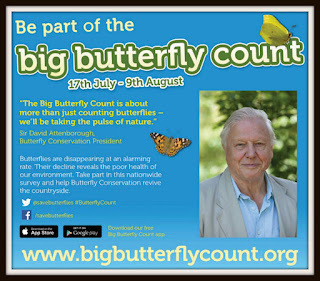 The Big Butterfly Count runs until 9th August. I'm taking part so why don't you? There are 59 different types of British butterflies. 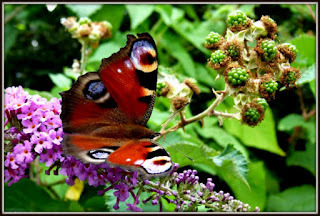 But Red Admiral, Peacock, Brimstone, Painted Lady, Comma, Green-veined White, Small Tortoiseshell, Small Cabbage White and Large Cabbage White are the butterflies you're most likely to see in your garden.To see more butterflies you should plant a range of flowers and herbs to provide them with nectar from March until October. The RHS has this really long list of plants you can grow to help encourage butterflies into our garden. Basically butterflies like bright colours and flowers that provide big landing sites for them. They like you to leave any over-ripe fruit that falls from your trees on the ground so they can feed on the fruit juices. Mummy butterflies also need somewhere to lay their eggs. As silly as it may seem, leaving a bit of your garden to grow weeds in is a great help! 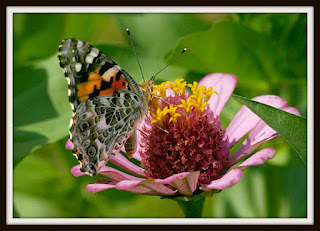 Red Admirals love to lay their eggs on stinging nettles and Painted Ladies will lay eggs on thistles. 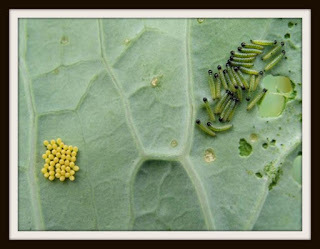 And of course the caterpillars are very hungry when they first hatch so they will munch on these weeds. So the bad bit of encouraging butterflies is caterpillars. But they are very picky about what they eat and it is only really the Large and Small Cabbage White varieties that like to eat crops that we grow. They love cabbages and other brassicas (like broccoli) and nasturtiums. So if you don't like eating either of those, don't grow them and you'll not get any pesky caterpillars trying to eat your food! Just by growing some nasturtiums beside your brassicas can save your crops as nasturtiums are butterflies favourite food (I prefer ice cream myself!) Or you can be very careful about looking out for little clusters of round yellow eggs on leaves and stems. Just remove these before they hatch into caterpillars. Or you can use insect barrier mesh over your veg beds. Be careful that the mesh doesn't touch any leaves as abbage White butterflies can lay their eggs through mesh onto any touching leaves. You could also use teeny, tiny worms called nematodes or really small wasps that are both natural ways to kill caterpillars. Butterflies don't live for very long so how about making a caterpillar that changes into a butterfly for you to keep for ever? Cut the egg box down the centre and stick the 2 bits together to make a long thin body for your caterpillar. Cut out butterfly wing shapes from the white card and paint a lovely bright pattern on them. Once body is dry add googly eyes to one end to make a face. Roll up both halves of one pipe cleaner to make 2 antennas and insert these above the googly eyes. This caterpillar is almost as hungry as I always am! Decorate the coloured card and then roll this around the caterpillar's body to make a cocoon. Place it somewhere warm overnight. The next day remove cocoon and use the other pipecleaner to fix the wings to the body. Unravel the antenna a bit. It's even more special if your Mummy or Daddy does this whilst you're still sleeping. Ta dah, your caterpillar has changed into a butterfly. Look what I found when I came down to breakfast! Thanks "Local Fun for Kids" for the idea. Right, It's sunny outside so I'm off to count butterflies! If you want to find out more about the different butterflies you can find in your garden have a look at the fab ukbutterflies website. They have loads of great photos. p.s. The title of this blog comes from "The cat who walks through walls" by R.A. Heinlein. It's a book for grown-ups that includes a kitten that walks through walls because it is too young to know that that isn't possible. I don't like being told what is and isn't possible either- I'm much rather find out myself! !